New research-led by IHS Markit vice chairman, Daniel Yergin and former U.S. Secretary of Energy and Energy Futures Initiative founder, Ernest J. Moniz-assesses the state of the clean energy innovation ecosystem in the U.S. and identifies clean energy technologies with the highest breakthrough potential. The report, entitled Advancing the Landscape of Clean Energy Innovation evaluates ways to maintain U.S. leadership in clean energy innovation by better aligning the policies, players and programs that will drive technologies that can keep the nation globally competitive. The report says that clean energy innovation is critical for national economic strength, competitiveness, security and for addressing effectively the challenges of climate change. It finds that longstanding U.S. leadership in this area will be maintained only if the existing ecosystem in strengthened. Greater coordination between all stakeholders is required to create the conditions for commercial adoption of groundbreaking clean energy technologies, it finds. 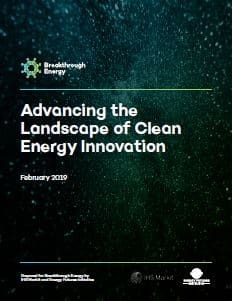 Advancing the Landscape of Clean Energy Innovation was produced by IHS Markit and the Energy Futures Initiative (EFI), with the support of Breakthrough Energy Coalition. The analysis and conclusions of this report are those of IHS Markit and the Energy Futures Initiative. IHS Markit and Energy Futures Initiative are solely responsible for its contents. For more information about the report, contact Tim Gardner. Download the complete report by filling out the form to the right.